The reason they bothered me is because I’m not enlightened (yet). There is still a part of me that wants everybody to get along. That same part of me is a people pleaser and is afraid of confrontation. Luckily for all of us, that part of me is not in charge. I can recognize when I’m afraid of dealing with a situation, understand why, and set that aside. This is partly because of my meditation practice, my general philosophy of life, but probably mostly because of my work to become a great partner. Being a great partner takes lots of practice. There are many subtle details and skills involved. But perhaps most important is a simple yet profound understanding. Your martial arts practice is not for you. 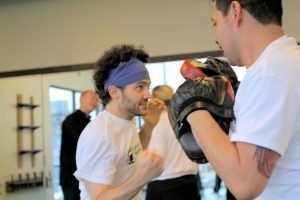 If you practice for yourself, in this moment you may win at push hands. You may tap your partner in Jiu Jitsu. But that excitement lasts only a moment, and you haven’t really learned anything from that experience. Likewise, if you lose, you experience disappointment, and haven’t learned anything. What a waste. Yet if you practice for your partner, you learn a higher level of detail from helping them and even losing to them. You seize the opportunity to grow, help your partner do the same, and create a situation where you both continue to improve. If you practice for yourself to become healthier, stronger, better able to defend yourself, or even more peaceful and mindful, you may make great progress. But eventually you’ll run out of motivation. You’ll get to a certain point and feel like it’s enough. On some level you’ll start to slack. Yet if your martial arts practice is for other people, there is no end to how much you can improve. There is an entire world of people out there, including not only your friends and family but your fellow students, coworkers and even strangers. They all stand to benefit from a better version of you. Many of you have practiced with another student and felt like they were really helpful in guiding you through the drill. Maybe you were practicing push hands in Tai Chi and your partner slowly made adjustments to your posture and weight shifts. Many of you have practiced with a senior student and felt like they just destroyed you. Maybe you were sparring and they lit you up with an overwhelming combination. Both things are appropriate during different situations and necessary from a great partner. Some of you reading this will think, “Wait a minute. I hate it when I spar with so and so and they beat me so badly they embarrass me.” Ask yourself, where does this embarrassment come from? Some of you will think, “That’s right! I’m SUPPOSED to beat my partners.” Sometimes. But ask yourself, where does this desire to beat your partner come from? The answer to both questions, of course, is the ego. This is what we come face to face with when practicing martial arts, especially in a confrontational drill like sparring or grappling. Yet that thin veil that separates you from your partner, and indeed the rest of the universe, can be pulled back to reveal the truth. This is an opportunity to transcend the small self. We must take it. The easiest way to get beyond the ego is to put someone else’s needs above yours. When I find myself dealing with a difficult situation, I remind myself that none of this is for me. Even a confrontation that would have scared me in the past becomes easy when I remember that it’s an opportunity for growth, and it’s not about me. My martial arts practice is about my partner, the other people in my life, and really the entire world. Thank you for a great lesson and reminder SifuScott. Years ago my Martial Arts master said, “Your ego is not your amigo”. As soon as your ego is out of the way, you create room for growth, compassion and love.